Cabin Series Serving Set - Features a natural glaze stoneware with dark green hand painted rim and includes a 9" diameter bowl and a 12" Round Platter. 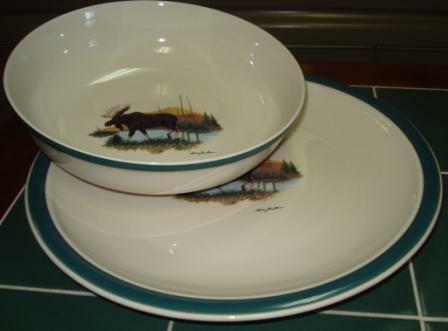 Decorated with the Scenic Landscape Moose, original artwork by Dann Jacobus. Decorated by hand in the U.S.A.. Product is Dishwasher and Microwave Safe.